In this Photo Retouch tutorial, we'll look at how to reduce the appearance of noise in an image, including luminance noise, color noise and even jpeg artifacts, all using the Reduce Noise filter, first introduced in Photoshop CS2 (which means you'll need at least CS2 to follow along). 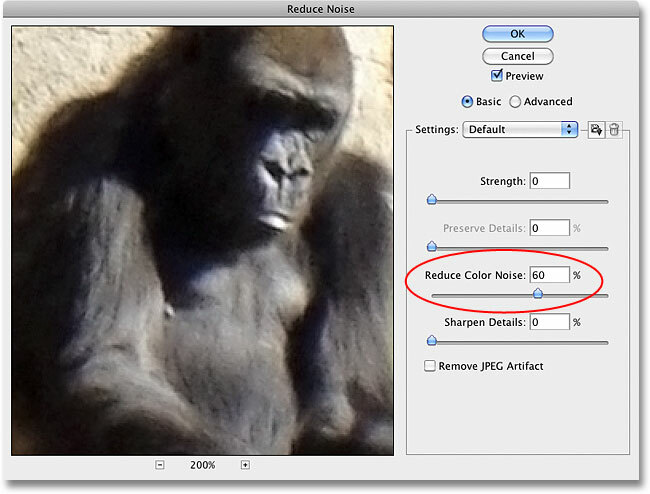 Notice that the name of the filter is Reduce Noise, not Remove Noise. As powerful as Photoshop is, there's still no way to take a noisy image and clean it up completely, at least not without removing most of the detail in the image along with it. Any time we shoot in low light, use high ISO settings, or leave the expensive dSLR at home because the compact camera is easier to carry, there's a good chance we'll be dealing with noise. Fortunately, while we can't remove it completely, Photoshop's Reduce Noise filter still does a good job of reducing noise without sacrificing important image detail. Let's see how it works. She may look bored, but you wouldn't like her when she's angry. Red, green and blue color noise is visible when we zoom in. The Reduce Noise dialog box contains a large preview area on the left so we can see what we're doing (although we can also see what we're doing in the document window itself as long as the Preview option is checked, which it is by default) and some sliders and options along the right. Even though it's not so obvious, the column along the right is actually divided up into different sections, with each section affecting a different type of noise. I've colorized the sections we're most interested in. The Reduce Noise filter dialog box. Different sliders and options reduce different types of noise. 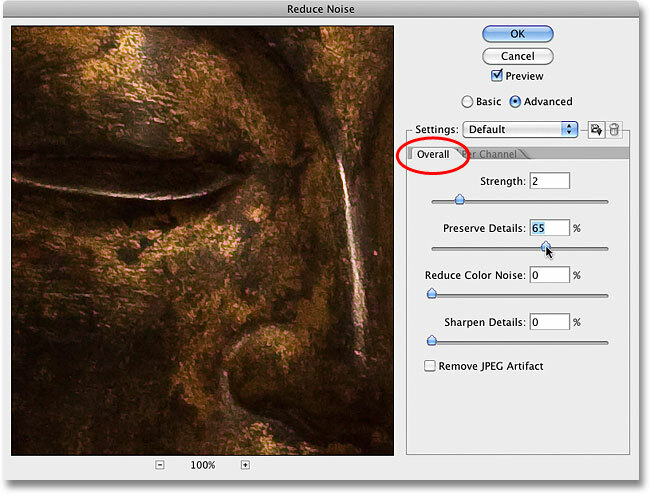 To get the most out of the Reduce Noise filter, it's best to begin by turning the filter off so it has no effect on the image. There's no actual "Off" button, but we can accomplish the same thing by dragging all of the sliders to the far left, which sets each option to 0. Also, make sure the Remove JPEG Artifact option is unchecked. Use the + and - icons to zoom in and out of the image. Click and drag to move the image around inside the preview area. 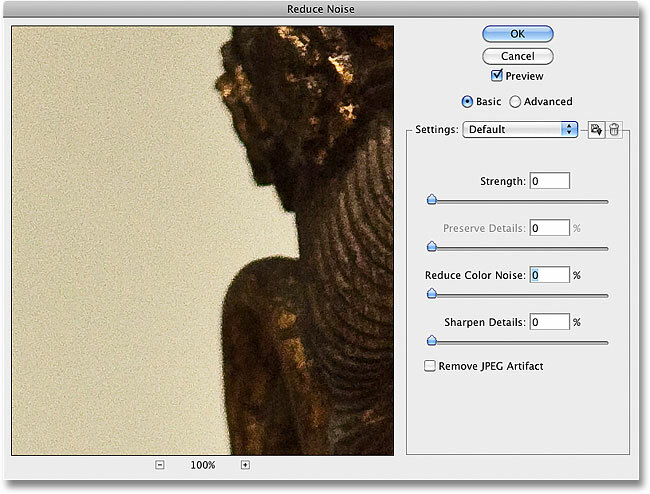 Drag the Reduce Color Noise slider towards the right until the color noise disappears. To quickly get a "before and after" view of the image so you can see how much of an improvement you've made, click and hold inside the preview area. This shows you what the original version looked like. 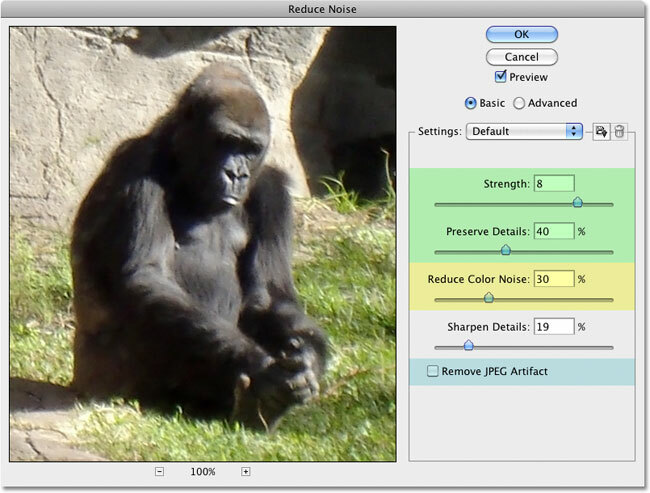 Release your mouse button to see the effects of the Reduce Noise filter. 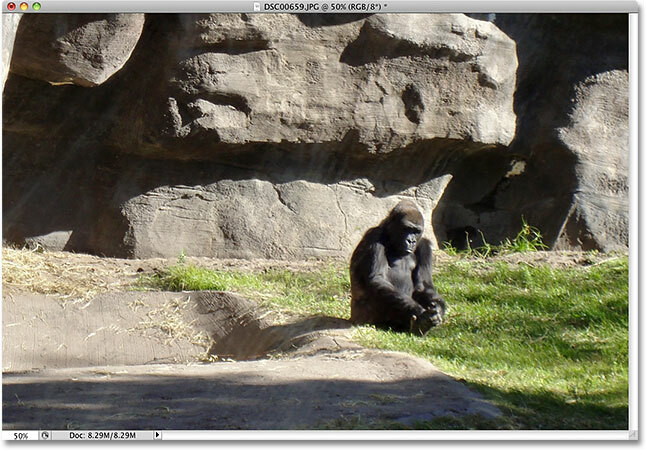 Dragging a single slider towards the right was all it took to remove the color noise from the image. Noise in an image can be hard to see when you're zoomed out too far. All those black, white and gray speckles are luminance noise. Removing luminance noise is a simple two-step process, but remember, we need to have realistic expectations. In my case here, there's no way I'll be able to make an image shot at ISO 2000 look just as clean and smooth as if I had shot it at ISO 100 or 200. All we can do is try to make the image look better than it did originally. 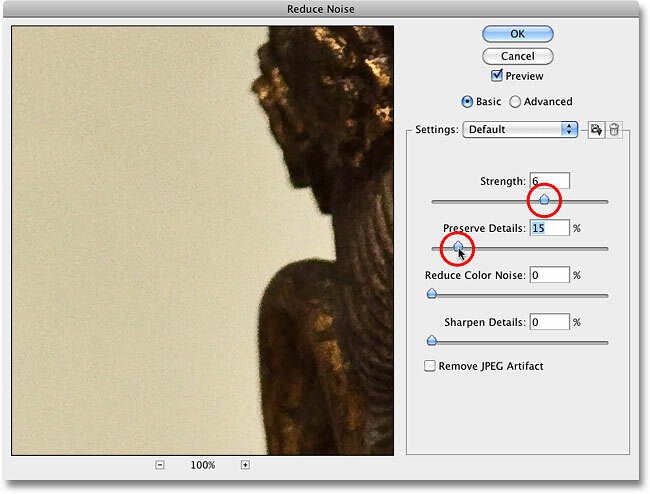 Remove as much noise as possible with the Strength slider, then bring back detail with Preserve Details. Select the Advanced option, then click on the Per Channel tab. Most images are made up of three color channels - Red, Green and Blue - and it's very common for one of these channels to contain more noise than the others, with the Blue channel often being the biggest offender. By reducing noise on a channel-by-channel basis, we can apply the strongest amount of noise reduction to the channel that needs it the most, leaving more image detail in the cleaner channels. Switch between the three color channels, then apply different amounts of noise reduction to each channel. When you're done with the individual channels, fine-tune things with the Overall sliders. Finally, whenever you're working with jpeg images, whether you're shooting jpegs with your digital camera or the image was saved as a jpeg in Photoshop or some other program, you'll encounter jpeg compression artifacts, which make the image look like it's been divided into a pattern of 8x8 pixel squares. 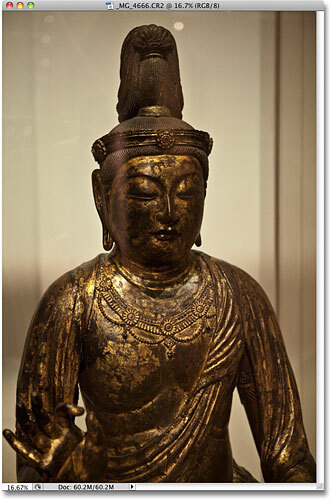 Just how visible these artifacts will appear depends on how much compression was used, as well as how many times the image was saved as a jpeg. 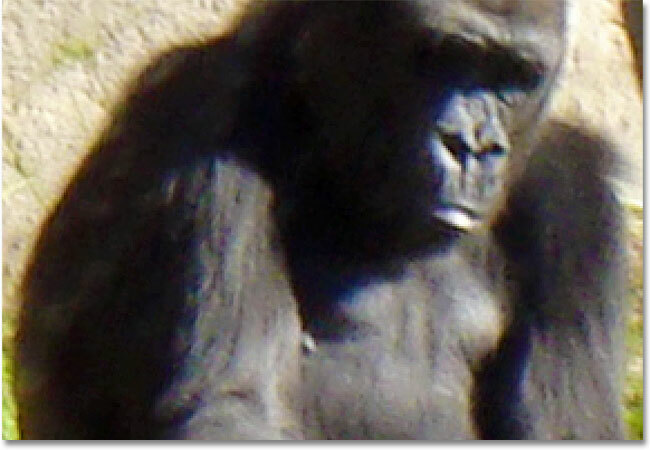 Each time you re-save a jpeg image as a jpeg image, the quality becomes worse. 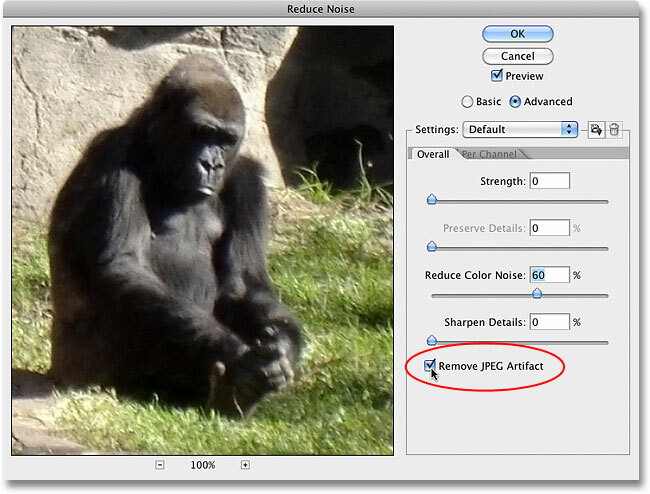 Select the Remove JPEG Artifact option to reduce the appearance of jpeg compression. 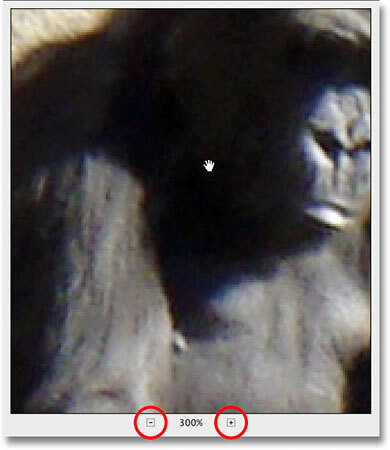 Make sure you inspect the image when this option is selected, since it could result in a loss of too much detail. As with luminance and color noise, it's always a trade-off between reducing noise and keeping as much image detail as possible. When you're done, click OK in the top right corner of the dialog box to apply all of the settings and exit out of the Reduce Noise filter.